About five years ago I started having some pain in my right hip. For awhile I simply thought it was a “hitch in my gitalong” -ha. But it never really went away. The pain always reappeared after a short walk, or sometimes when I twisted funny or swung my leg sideways, while turning on a scrub sink with my knee/leg at work. But… it wasn’t really terrible so I did my best to try to ignore it. In the past year or so, it’s started “popping”. Not out of joint, but like something was catching on something inside my hip. Last June I went to my primary care doctor, she ordered an x-ray, and proclaimed my hip “okay”. No arthritis, so you must be fine. As this year has passed, my hip has started “popping or snappping” more often and with it, a LOT of pain. Finally hubby said – GO TO THE ORTHO DOC! And finally, I did. In early September, I walked into the orthopedic doctor’s office and said I needed to be seen. No problem they told me… and set up my appointment for the 22nd of the month. When Wednesday the 22nd came along, I went to the office, paid my $25 copay and visited with the doc. After listening to my history and symptoms, he thought maybe I have a “labral tear” which is much like a rotator cuff on a shoulder, but obviously this is on my hip socket/joint. He said that the x-ray could never detect it, so I’d need to have an arthrogram and MRI of the joint. “Okay” I said, reluctantly. I knew that meant INJECTING the joint with dye but at the same time I really want to know whats going on inside there. I waited about 10 minutes until his nurse came back into the exam room where she presented me with an order for the arthrogram – MRI. It was set for today, September 30th. Luckily it was not a work day for me. I was fretting a bit about the whole thing, knowing that I’d need the injection into the joint for not only the dye, but also my doctor had prescribed a cortisone shot as well. Yikes. Two joint injections. This can’t be a good thing. The cortisone is supposed to stop the inflammation and possibly even correct the whole problem, so it was definitely worth a try. Only time will tell on that one. So, today it all happened. I got one injection of dye (which honestly I couldn’t feel at all!!!) and then came the cortisone. It was a large amount (15cc) and the pressure it gave me was the weirdest feeling of pressure I’d ever had. I survived it though, and then walked into the MRI room. THANK THE LORD I didn’t have to have my entire body inside the tube. 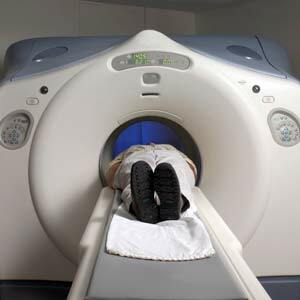 The kind MRI techs left my head hanging out – whew! I do tend to get claustrophobic at times. I laid there as still as possible for 25 minutes and then it was done. YAY! I have no results and don’t expect to hear any until next week sometime – but at least it’s over and now I’ll have an answer to WHY my hip is the way it is. What (if anything) I’ll do about it is yet to be seen. Compare my scenario to my step son’s experience where he lives, Canada. In early spring, (or possibly even earlier) Rich noticed pain in his shoulder. He does a lot of lifting at work and it was really starting to bother him. He went to see his primary care doc and got referred to an orthopedist. His appointment was in August. At the appointment, the orthopod wasn’t sure just what the problem was/is so referred Rich for a diagnostic MRI. In September the MRI people phoned him and said… “see you in July, 2011”. JULY 2011 !!! In the meantime, Rich has to suffer along with lots of pain while he works and has no idea if he is causing his shoulder MORE damage, or what! When he heard about me going to the doctor in mid September and getting my MRI in late September he was shocked. And mad. But there isn’t a thing he can do about it. Folks, THIS is what it would be like if we had a single payer health plan — the plan that a lot of folks supposedly are upset that we didn’t get in Obama’s new “hellthcare” program. Think about it again people. This is NOT what we want. Yes, we need some changes to improve our system, but please, please, please, NOT a single payer plan…. and unless you’ve had your head in the sand since March, that’s certainly the way we’re headed. This entry was posted in General Musings and tagged arthrogram, hip, MRI, Obama's healthcare. Bookmark the permalink.